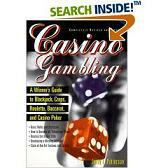 In this section, we’ve compiled of list of useful and worthwhile books concerning gambling and casino activities. Some of them may be helpful only in certain areas; others may focus more on specific issues or present a broad overview of several activities; and, some are nothing more than stories or accounts related to gambling yet interesting and worthwhile nonetheless. All in all, however, the information covered in the books below includes valuable analyses, stories, strategies, warnings, and ideas for the beginner and seasoned-player alike. Follow the links for more information! This book provides easy-to-read and updated analysis and strategies for the most popular casino games while including useful information on ways to effectively increase the odds of winning. Useful to players at all levels and a great starting point for any beginner focused on either online gambling or the ‘live’ variety. Although not as new as some of the other guides, this ‘unofficial’ guide provides valuable introductory information and clearly explains the ins-and-outs of numerous casino games including slots. Worth looking into for any player and certainly a helpful complement to knowledge gained from first-hand experience and/or a reading of other texts. Excellent book for those players focused on the recently popularized and notorious “Hold’em” version of poker. Harrington and Robertie’s piece provides a good source of information for those wishing to prepare themselves with knowledge before playing or for others seeking to complement their first-hand experiences with detailed information regarding strategies. If “Hold’em” is your game, this is good book to check out. As the title implies, the information presented here represents a very basic (yet thorough) introduction to gambling and casino games. True to form, this book is easy to read, provides helpful lessons in an understandable format, and would be a good starting point for any beginner. This series always does a good job of presenting their subjects clearly (and even in-depth) and this edition is no exception. Once again, a less recent publication on our list, Scoblete’s text nonetheless could be quite useful to some people. While it doesn’t reveal anything ‘earth-shattering’, this book still manages to share and provide some interesting and sound strategies for all sorts of casino games and even ways in which to increase ‘comps’ at live casinos and improve your overall experience. A good choice for perhaps the intermediate player who often spends time at ‘live’ casinos. In this book, Malmuth explains several of the underlying formulas and concepts that make gambling what it is. In other words, he points out and describes the ‘theories’ behind several different games and what strategies, from a mathematical standpoint, are usually most effective. This text would certainly be suitable for all players, but is perhaps more appropriate for intermediate-advanced players wishing to get a grasp on probabilities and ‘theories’.